The sun is shining, the birds are chirping, and summer is finally in the air in the Twin Cities. For many people, summer means one thing: It’s officially the start of patio season. There is a wide assortment of fun and trendy patio restaurants scattered all across the Twin Cities, but how do you know which ones can’t be missed this summer? Check out REE’s list of the 10 Best Patio Restaurants in the Twin Cities to get a head start on your summer fun. 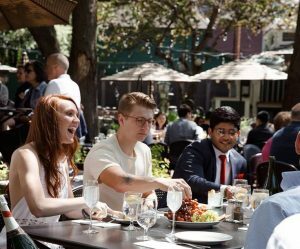 Check out REE’s list of the 10 Best Patio Restaurants in the Twin Cities to start your summer fun. Want a Maui feel without leaving Minnesota? Psycho Suzi’s Motor Lounge brings tropical drinks, food, and vibes to the usually un-tropical Northeast Minneapolis area with a patio that overlooks the river. The patio is decorated with palm leaves and bamboo torches, and a wide assortment of tropical drinks served in tiki cups will make you forget winter even exists. If you’re hungry, the food menu is just as appealing, with a variety of food options ranging from a pupu platter to deep dish pizza. If you’re looking to get the feel of a tropical vacation without spending the travel fare, then Psycho Suzi’s is the place to be. Looking to grab a pint in the heart of downtown Minneapolis? Check out Brit’s Pub & Eating Establishment! Summer at Brit’s is punctuated by one thing: lawn bowling. Along with the not one but two patios Brit’s has, they also have a large lawn that acts as the perfect place for any and everyone to get in a game of lawn bowling while they enjoy their drink. Brit’s is UK-themed, so they often host viewing parties for British-related events, such as big football (soccer) matches or the Royal Wedding. The menu is full of traditional British drinks and food (fish & chips, anyone?) alongside all of the usual bar favorites. If you want to take in another culture for an afternoon, stop by Brit’s! Betty Danger’s calls itself “A Country Club for the 99%.” Located in the Northeast Arts District of Minneapolis, Betty Danger’s prides itself in being kooky, different, and downright fun. If you want proof of this, look no further than the dog-friendly mini-golf course and ferris wheel in the parking lot. Betty Danger’s is one of the most dog-friendly patios in the Twin Cities, and it’s perfect for those who want the option of doing activities or just hanging out on a patio and watching dogs play on a mini-golf course. The menu carries a variety of Tex-Mex food and drink items for you to peruse, which just adds spice to an already spicy establishment. Want a restaurant with a patio that’s just downright fun? If you like combining craft beers and cocktails with good friends and fun activities, then Libertine is the spot for you. Libertine is full of all sorts of games that will help you and your friends enjoy some friendly competition. Everything from table tennis to pinball to Shoots and Ladders can be found inside, but the real fun happens on the roof. The rooftop of Libertine is set up with multiple games, including a giant beer pong setup. If you go at night, you can be treated to an enchanting atmosphere with plenty of globe lights that create a summer ambiance worth dying for. Speaking of ambiance, nobody has the ambiance that Louis Ristorante & Bar has. Not only does Louis have the largest rooftop bar in St. Paul, but it might also be the most elegant. The rooftop bar overlooks downtown St. Paul and presents a view that cannot be matched anywhere in the Twin Cities area. Once the beauty of the view wears off, go downstairs and check out Louis’s expansive and delicious Italian eatery. Top it all off with some delicious gelato as you watch the sun set on the city. 6. W.A. Frost and Co. If you are looking for something a bit more sophisticated, you need to stop by W.A. Frost in St. Paul. The expansive patio triples the size of the restaurant’s seating area, and it also features a first-come, first-served lounge and bar area. Located in the historic Cathedral Hill neighborhood, this restaurant serves a wide variety of delectable contemporary American cuisine that will make you forget all about typical bar food. If you’re looking for beauty and charm out of your patio experience, then W.A. Frost should be your first stop. Aster Cafe provides the perfect blend of old-time atmosphere with modern aesthetic. Overlooking the Mississippi River at St. Anthony Main, this patio gives you one of the best views of downtown Minneapolis you can ask for. But, it won’t just be your eyes that are getting treated when you have a meal at Aster Cafe. There is great live music that creates a lively atmosphere regardless of if you’re there for brunch or a late dinner. The menu is full of fresh food and delicious drinks that tie everything together. Whether you’re there for a private event or just a Wednesday happy hour, Aster Cafe is the place to be. When patio season is not long enough (and in Minnesota, it never is), then Union is the place for you. This downtown Minneapolis bar has a retractable glass roof, making for a patio area that can be enjoyed year round. Union is known for providing a dazzling and quirky brunch atmosphere, especially with its Flip Phone’s Drag Brunch. The patio is located in downtown Minneapolis, meaning you’ll be able to look out at all the hustle and bustle of the city. Come enjoy a summertime experience year round at Union! Want to be close to the water without leaving the comfort of the patio? Jax Cafe is your answer. The claim to fame for Jax Cafe is the gorgeous brook of water that runs through the middle of the patio. This piece is accentuated by a miniature wooden mill, stepping stone bridges, and a calming waterfall. As if it couldn’t get any more exciting, the brook is inhabited by rainbow trout that you can fish out using a net. You can then take your catch to the kitchen to have it broiled or sautéed and served to your table. If you aren’t in the mood for fish, you can choose to sit near the outdoor fireplace or by one of the many bushes sprouting lush, colorful flowers. Enjoy this little slice of nature in the middle of an urban hotspot by stopping by Jax Cafe today! Looking for a cool spot that will impress out-of-towners without costing you a fortune? 4 Bells is the place for you. The rooftop patio provides a great view of Loring Park and an even better selection of seafood and drinks. If you want your seafood fresh, there is no need to worry here — all of the food at 4 Bells is shipped overnight from the coasts, or it comes straight from the lakes and rivers of Minnesota. Pair this with the wide selection of drinks, and you have an evening of relaxation ahead of you. Stop by 4 Bells today! The Twin Cities area is loaded with hidden gems and places worth checking out. There are so many patios that didn’t make this list that are still well worth checking out. All of these locations and hotspots are just another reason why the Twin Cities is becoming an increasingly popular place to live. Do you have an apartment in the Twin Cities that you love yet? Get one before the rush and contact REE Apartments today!